^ Rüger, C. (2004) . "Germany". In Alan K. Bowman; Edward Champlin; Andrew Lintott (eds.). 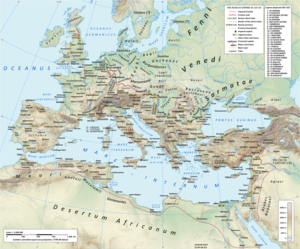 The Cambridge Ancient History: X, The Augustan Empire, 43 B.C. - A.D. 69. 10 (2nd ed.). Cambridge University Press. pp. 527–528. ISBN 0-521-26430-8.